One of the most charming and romantic destinations the world over, Venice, Italy, is imbued with a sense of mystery. Fittingly, the city has been the setting for countless plays, novels, and films about love and intrigue, among them Shakespeare’s Othello, Patricia Highsmith’s award-winning and best-selling novel The Talented Mr. Ripley, and Spielberg’s Indiana Jones and the Last Crusade. Contributing to the ambience of Venice are architectural gems that have generated a myriad of postcard images; two such places are the Rialto Bridge, which spans the Grand Canal, and Piazza San Marco (St. Mark’s Square). Alongside the many iconic structures, however, there exists a very different Venice—one that has been captured by photographer Russ Schleipman. From architectural and engineering standpoints, Venice is unique: there is no other city like it in the world. It comprises six sestieri (neighborhoods) built atop an ancient system of wooden pilings and platforms on 118 mostly tightly knit islands in the marshy Venetian Lagoon. With a width and length of approximately two and three miles, respectively, it is a very walkable city—which is a good thing because the only other means of transportation is by water: water taxi, gondola, or vaporetto (canal bus). 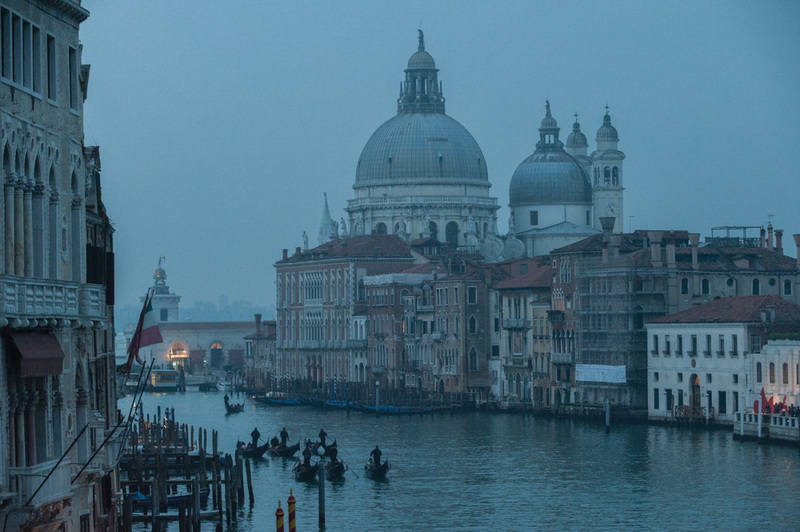 Her intricate maze of churches, buildings, and plazas—linked by over four hundred bridges crossing a system of more than 170 canals—makes Venice extremely rich with inspiration for a photographer’s lens. So, when a spontaneous invitation presented itself to Russ Schleipman last January to share an apartment in Venice for a week, he was game. “Having been before, and being totally enthralled by the place, I jumped at the opportunity,” said Schleipman. “I looked at it as a way to dive into a new, wonderful, and very different environment. 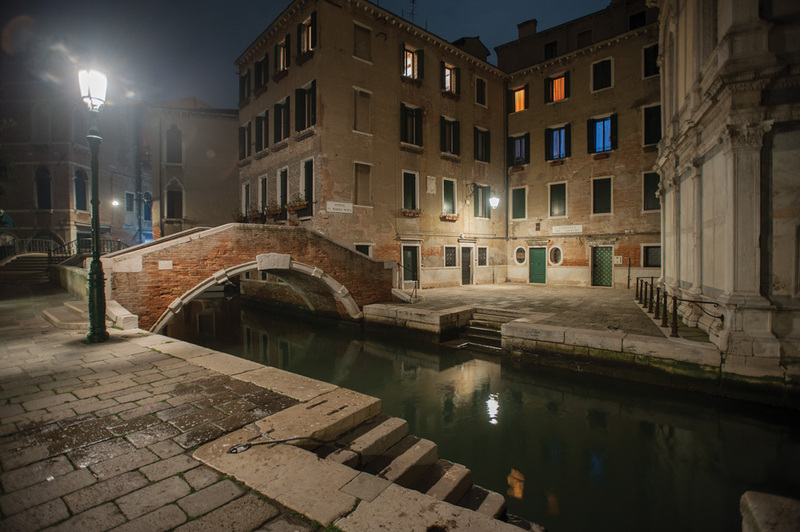 Walking the southern side of the Grand Canal late one evening, avoiding the chaos of St. Mark’s Square, we happened upon a delightful scene in the heart of Venice—a slice of pure Americana on a street with a very un-American name: Rio Terrà dei Catecumeni. 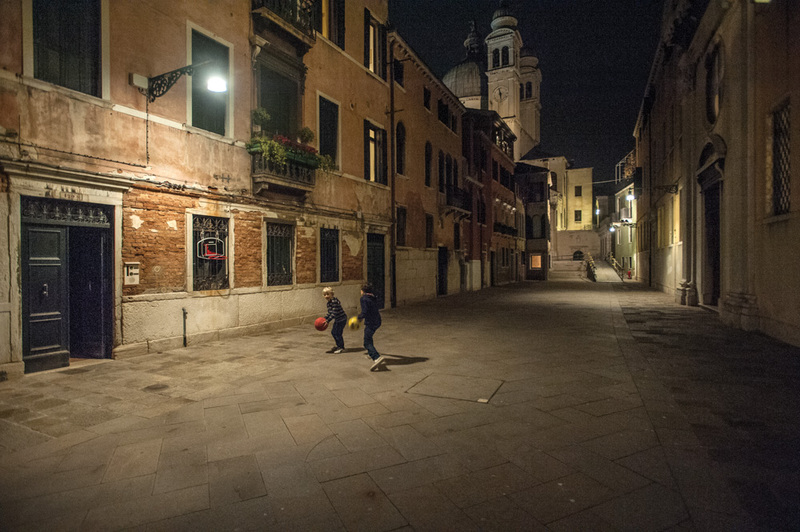 Under the towering dome of the Basilica di Santa Maria della Salute, two youngsters had hung a hoop and were so into their game that they ignored me completely as I photographed them for ten minutes. Their banter, in lilting Venetian dialect, made a quirky accompaniment to basketball. On Rio de la Fava, another timeless wall wears the texture of centuries. If only it could speak. Gracing the entrance to the Grand Canal, the Basilica di Santa Maria della Salute, known simply as La Salute, soars breathtakingly above the surrounding structures. One cannot help but reflect on the wonders of the Baroque. Here, at the end of a dusky day, the gondoliers, nimble boatmen to a man, return home. The basilica, begun in 1631, is supported by more than a hundred thousand pilings and houses many works by Titian and one by Tintoretto. Photo One: Walking the southern side of the Grand Canal late one evening, avoiding the chaos of St. Mark’s Square, we happened upon a delightful scene in the heart of Venice—a slice of pure Americana on a street with a very un-American name: Rio Terrà dei Catecumeni. Under the towering dome of the Basilica di Santa Maria della Salute, two youngsters had hung a hoop and were so into their game that they ignored me completely as I photographed them for ten minutes. Their banter, in lilting Venetian dialect, made a quirky accompaniment to basketball. Photo Two: On Rio de la Fava, another timeless wall wears the texture of centuries. If only it could speak. Photo Three: Gracing the entrance to the Grand Canal, the Basilica di Santa Maria della Salute, known simply as La Salute, soars breathtakingly above the surrounding structures. One cannot help but reflect on the wonders of the Baroque. Here, at the end of a dusky day, the gondoliers, nimble boatmen to a man, return home. The basilica, begun in 1631, is supported by more than a hundred thousand pilings and houses many works by Titian and one by Tintoretto. With over eighteen million visitors per year, Venice certainly sees its fair share of cameras. Schleipman was looking forward to the challenge of overcoming the clichés of one of the most photographed places on the planet. “I wanted to push myself to come up with something new and a little different,” said Schleipman. 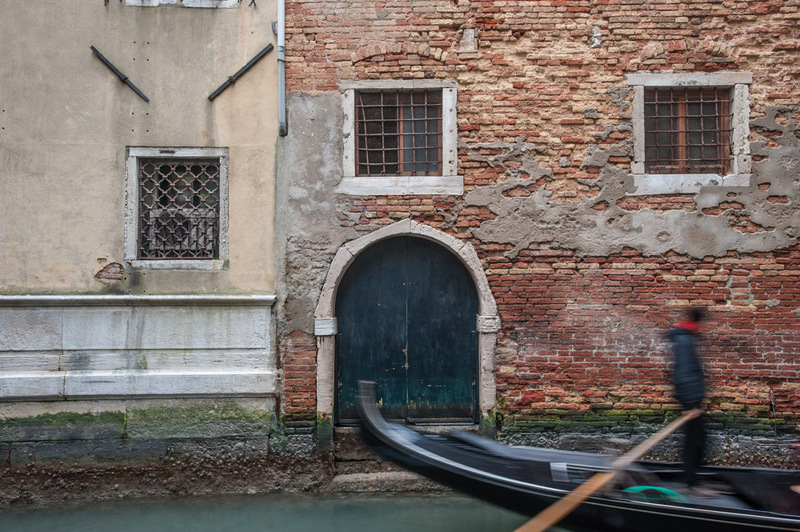 Wanting to capture Venice in an unexpected and, hopefully, beautiful state, Schleipman was blessed with conditions that would dash the hopes of most photographers. “I was lucky to inherit gray, foggy weather and not the process-blue postcard skies. Thank God!” he exclaimed. 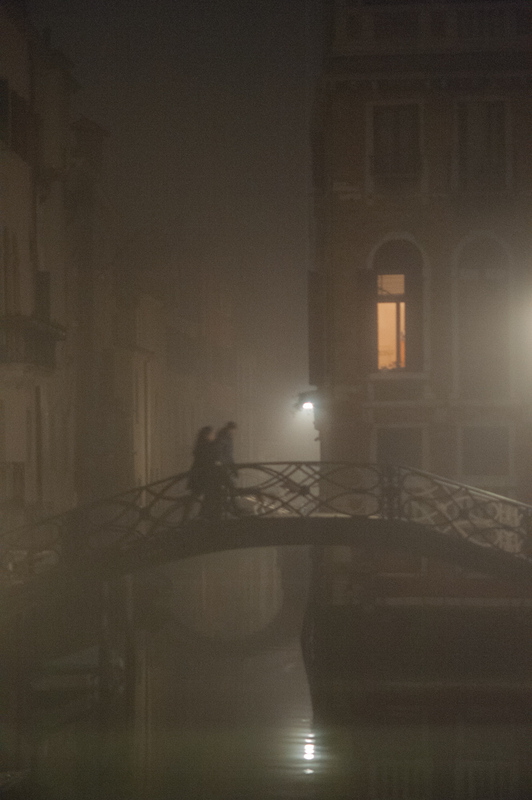 Fog was made for Venice. It wraps the city in a layer of mystery and silence, which only magnifies the magic of the place in any weather. Wandering the sestiere of Cannaregio with no special destination, I stepped into a long campo, Salizada dei Spechieri. At the far end towered a magnificent, powerful cluster of columns: the Jesuit Church of Santa Maria Assunta, also known as I Gesuiti. The care, the craftsmanship, and the eye for beauty are overwhelming. How did we descend to strip malls? Lost in the labyrinth, I spied a late-night couple—the only souls I saw for over an hour. 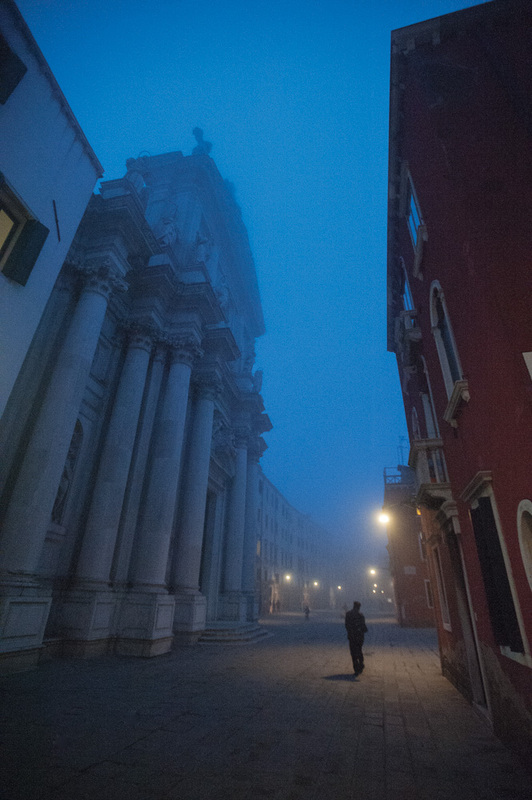 Photo One: Fog was made for Venice. It wraps the city in a layer of mystery and silence, which only magnifies the magic of the place in any weather. Wandering the sestiere of Cannaregio with no special destination, I stepped into a long campo, Salizada dei Spechieri. At the far end towered a magnificent, powerful cluster of columns: the Jesuit Church of Santa Maria Assunta, also known as I Gesuiti. The care, the craftsmanship, and the eye for beauty are overwhelming. How did we descend to strip malls? Photo Two: Lost in the labyrinth, I spied a late-night couple—the only souls I saw for over an hour. Venice was so quiet. All you could hear was the lapping water and the shuffle of feet on ancient stone. That silence combined with the ghost imagery of people moving among the fog made it magical! Campo Santa Maria Nova—the square, which holds Santa Maria dei Miracoli, a favorite wedding site. Newlyweds come and go by gondola, embarking on steps worn by countless predecessors. 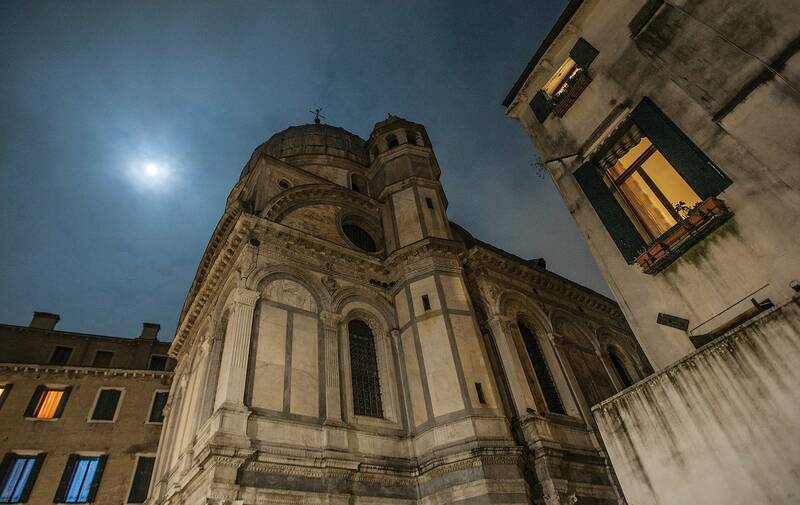 Photo One: Campo Santa Maria Nova—the square, which holds Santa Maria dei Miracoli, a favorite wedding site. Newlyweds come and go by gondola, embarking on steps worn by countless predecessors. Like wine, art is for sharing. I create images to share them with others. There is tremendous satisfaction in the creating, but the knowledge that I might delight, surprise, or inform others is my motivation. The work on my website reflects decades of wonderful travel and rich experience, from Saharan crossings to flying in ultralights over Mont Saint-Michel to befriending penguins at the Strait of Magellan. I strive to reveal the unusual in the usual and find beauty in the mundane or regularly unnoticed. Grand vistas from the Sahara, Australia, France, and elsewhere, intimate botanical studies, people, machinery, and simple household objects all hold visual secrets and have their unique story, which I try to tell with rigorous attention to design and composition.